The ATA reports section in the console enables you to generate reports that provide you with system status information, both system health and a report of the suspicious activities detected in your environment. Summary report: The Summary report presents a dashboard of the status in the system. You can view three tabs - one for a Summary of what was detected on your network, Open suspicious activities that lists the suspicious activities you should take care of, and Open health issues that lists ATA system health issues you should take care of. The suspicious activities listed are broken down by type, as are the health issues. 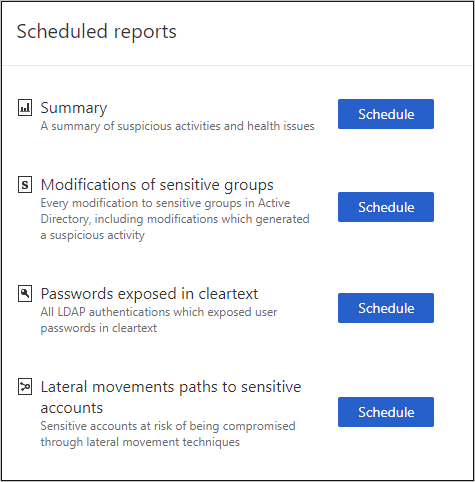 Modification of sensitive groups: This report lists every time a modification is made to sensitive groups (such as admins). Passwords exposed in cleartext: Some services use the LDAP non-secure protocol to send account credentials in plain text. This can even happen for sensitive accounts. Attackers monitoring network traffic can catch and then reuse these credentials for malicious purposes. This report lists all source computer and account passwords that ATA detected as being sent in clear text. There are two ways to generate a report: either on demand or by scheduling a report to be sent to your email periodically. In the ATA console menu bar, click the report icon in the menu bar: . Under either your selected report type, set the From and To dates and click Download. 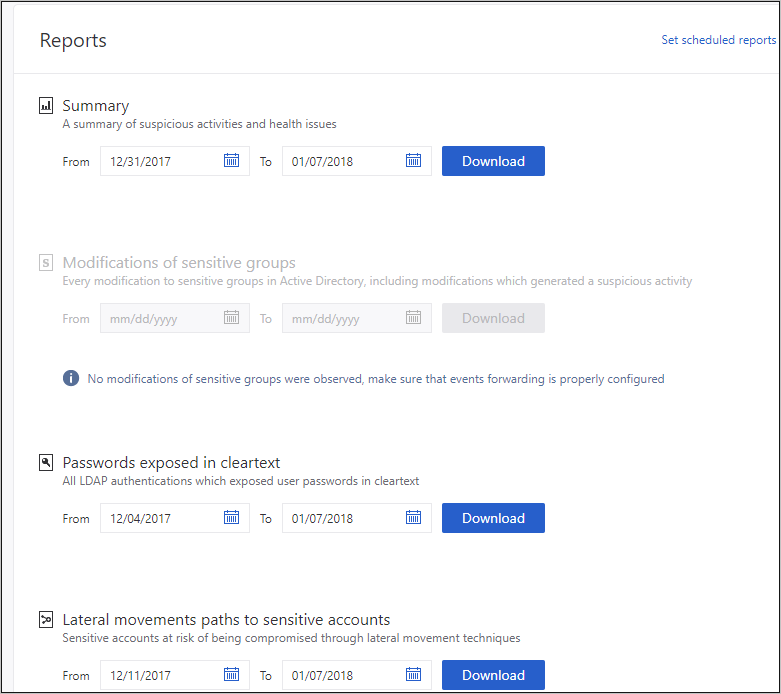 In the Reports page, click Set scheduled reports, or in the ATA Console configuration page, under Notifications and Reports, click Scheduled reports. The daily reports are designed to be sent shortly after midnight, UTC. Click Schedule next to your selected report type, to set the frequency and email address for delivery of the reports, and click the plus sign next to the email addresses to add them, and click Save. Scheduled reports are delivered by email and can only be sent if you have already configured an email server under Configuration and then, under Notifications and Reports, select Mail server.